A growing list of airline carriers and aviation regulators around the world are grounding fleets of the Boeing 737 Max 8 aircraft in the wake of a crash of the same model that killed all 157 people on board. A new Boeing 737 Max 8 operated by Ethiopian Airlines went down in clear weather on Sunday morning just minutes after taking off from Addis Ababa Bole International Airport in Ethiopia's capital. The American-made jet was headed to Nairobi, Kenya. A total of 149 passengers and 8 crew members were believed to be on board Flight 302, according to Ethiopian Airlines. The cause of the crash is under investigation. The National Transportation Safety Board (NTSB) of the United States said it's sending a team of four to assist in the probe. The U.S. Federal Aviation Administration said it plans to join the NTSB in assisting Ethiopian authorities. Ethiopian Airlines said two black boxes -- the digital flight data recorder and the cockpit voice recorder -- have been recovered from the wreckage in the town of Bishoftu, southeast of Addis Ababa. Another 737 Max 8 crashed into the Java Sea minutes after takeoff from Indonesia on Oct. 29, killing all 189 people on board. 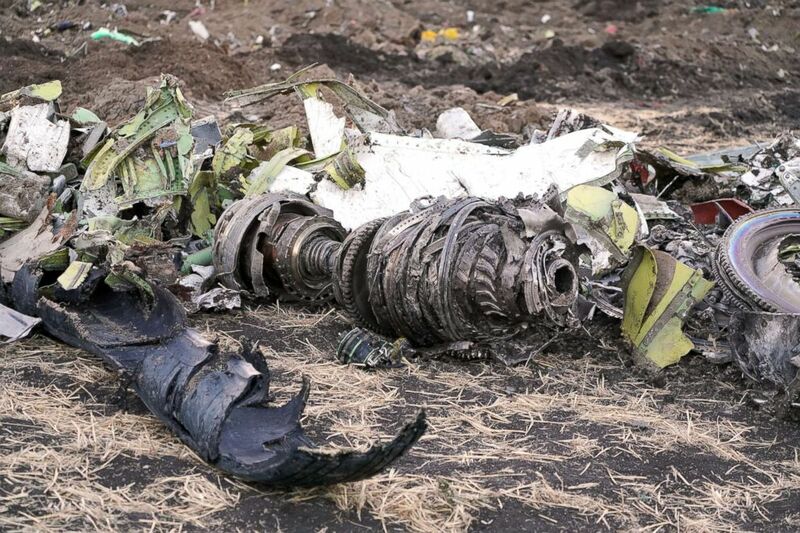 Parts of an engine and landing gear lie in a pile after being gathered by workers during the continuing recovery efforts at the crash site of Ethiopian Airlines flight ET302 on March 11, 2019 in Bishoftu, Ethiopia. Ethiopian Airlines, the flag carrier of the East African nation, decided to ground its remaining Boeing 737 Max 8 aircraft "until further notice." "Although we don't yet know the cause of the accident, we had to decide to ground the particular fleet as extra safety precaution," the state-owned airline said in a statement early Monday. Airlines in other countries also have announced the grounding of Boeing 737 Max 8 fleets, including Cayman Airways, the flag carrier airline of the Cayman Islands; South Africa-based airline Comair; Aeromexico, Mexico's flag carrier airline; Aerolineas Argentinas, Argentina's largest airline and flag carrier; Gol, Brazil's largest airline; Royal Air Maroc, Morocco's national carrier; South Korean airline Eastar Jet; Turkish Airlines, Turkey's national flag carrier airline; and Norwegian Air Shuttle, Norway's largest airline. Sunwing became the first Canadian airline to ground its MAX 8s, four of them, early Wednesday. The European Union Aviation Safety Agency on Tuesday suspended all flight operations of Boeing 737 Max 8 and 737 Max 9 aircraft models from flying into or out of Europe, "as a precautionary measure," amid the ongoing investigation into Sunday's crash. A number of nations had already issued restrictions on the embattled jetliner. China's aviation regulator has ordered all Chinese airlines to suspend operations of the Boeing 737 Max 8, nearly 96 jets. Using those planes won't resume until "confirming the relevant measures to effectively ensure flight safety," the Civil Aviation Administration of China said in a statement Monday. Indonesia has temporarily grounded its Boeing 737 Max 8 fleet while aircraft inspections are carried out to ensure "flight-worthy conditions." The country's Directorate General of Civil Aviation has been supervising operations of the 737 Max 8 since the crash in October. 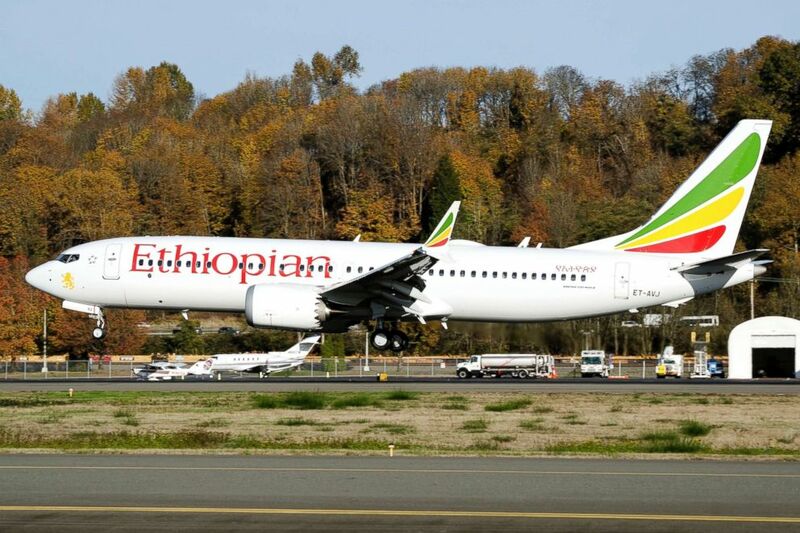 In this photo dated November 12, 2018, the actual Ethiopian Airlines Boeing 737 - Max 8 plane, that crashed on March 10, 2019 in Addis Ababa, Ethiopia, is pictured as it lands at Seattle Boeing Field King County International airport. Singapore's aviation regulator has indefinitely banned all Boeing 737 Max aircraft from flying into and out of the country. The suspension affects five airlines, the Civil Aviation Authority of Singapore said in a statement Tuesday. Australia has temporarily suspended operations of Boeing 737 Max planes to or from the country. While no Australian airlines operate these aircraft, two foreign airlines fly them to the country, the Civil Aviation Safety Authority of Australia said in a statement Tuesday. Malaysia has also suspended operations of Boeing 737 Max 8 jets flying to or from the country "until further notice." Oman's aviation regulator has indefinitely banned Boeing 737 Max aircraft from flying into and out of the nation. The United Kingdom has ordered a suspension on any Boeing 737 Max 8 commercial passenger flights arriving, departing or overlying the country's airspace. The temporary ban is "a precautionary measure," the U.K. Civil Aviation Authoritiy said in a statement Tuesday. The Irish Aviation Authority has temporarily suspended the entry and exit of all Boeing 737 Max aircraft from Ireland's airspace. 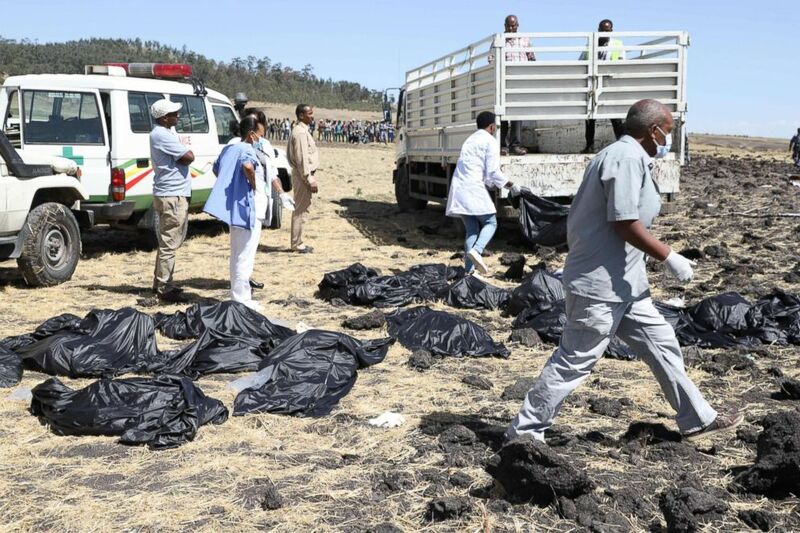 Rescue teams walk past collected bodies in bags at the crash site of Ethiopia Airlines near Bishoftu, southeast of Addis Ababa, Ethiopia, March 10, 2019. Meanwhile, the U.S. Federal Aviation Administration issued a "continued airworthiness notification to the international community" on Monday evening for Boeing 737 Max 8 operators, signaling confidence in the jetliner. The Boeing Company said it currently "does not have any basis to issue new guidance to operators" of its 737 Max 8 model. "We have engaged our customers and regulators on concerns they may have -- and would refer you to them to discuss their operations and decisions," a Boeing spokesperson told ABC News in a statement Monday morning. "Safety is our number one priority and we are taking every measure to fully understand all aspects of this accident, working closely with the investigating team and all regulatory authorities involved. The investigation is in its early stages, but at this point, based on the information available, we do not have any basis to issue new guidance to operators." In a letter sent to employees later Monday, Boeing's president, chairman and CEO said "the Max family has completed hundreds of thousands of flights safely. We are confident in the safety of the 737 Max." The Chicago-based aircraft manufacturer has supplied more than 370 Boeing 737 Max 8 aircraft to 47 airlines since the model entered service in May 2017. Seventy-two of them are currently flying in the United States, according to Boeing. 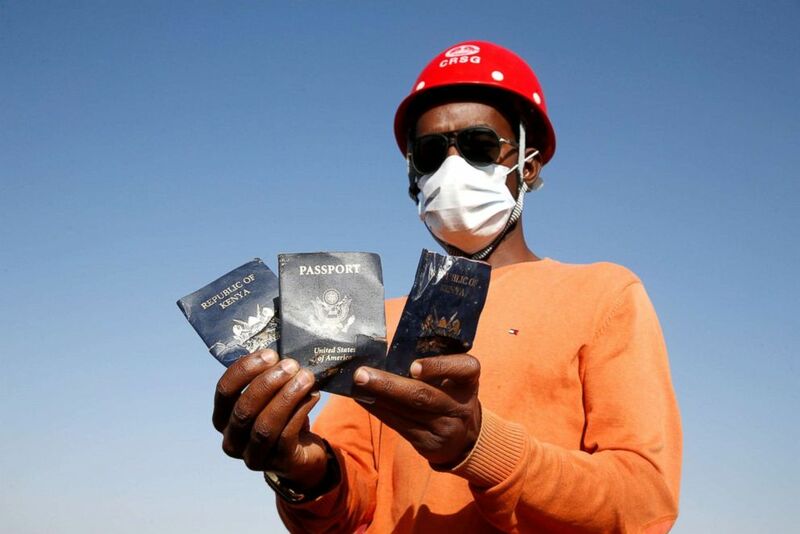 A man holds passengers' passports found at the scene of the Ethiopian Airlines Flight ET 302 plane crash, near the town of Bishoftu, Ethiopia, March 12, 2019. Thirty-five countries lost citizens in Sunday's deadly crash. Kenya lost the most, 32 people, according to The Associated Press. At least eight Americans were among those killed. The U.S. Embassy in Ethiopia said it is "working to determine their identities." ABC News has confirmed with family members that Melvin and Bennett Riffel from Redding, California, Antoine Lewis from Matteson, Illinois, and Matt Vecere, a California resident originally from New Jersey, died in the plane crash. United Nations Secretary-General Antonio Guterres said at least 21 U.N. staff were aboard the doomed flight. "Our colleagues were women and men -- junior professionals and seasoned officials — hailing from all corners of the globe and with a wide array of expertise," Guterres said Monday. "They all had one thing in common -- a spirit to serve the people of the world and to make it a better place for us all." An excavator works at the crash site of an Ethiopian Airlines' aircraft near Addis Ababa, capital of Ethiopia, March 10, 2019. Ethiopian Prime Minister Abiy Ahmed declared Monday a national day of mourning. Boeing said it was "deeply saddened" by the crash. "We extend our heartfelt sympathies to the families and loved ones of the passengers and crew on board and stand ready to support the Ethiopian Airlines team," the company said in a statement Sunday. 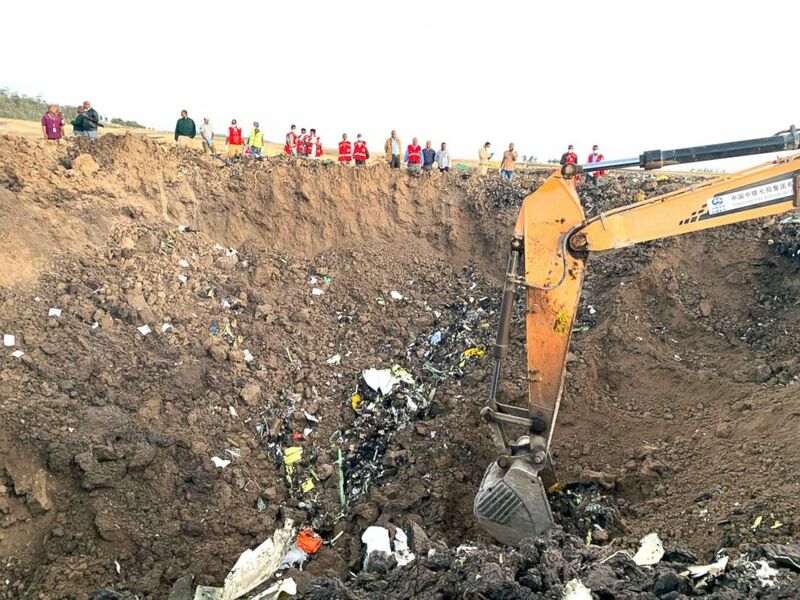 "A Boeing technical team will be travelling to the crash site to provide technical assistance under the direction of the Ethiopia Accident Investigation Bureau and U.S. National Transportation Safety Board." ABC News' Jeff Cook, Ben Gittleson, Joshua Hoyos, David Kerley and Amanda Maile contributed to this report.